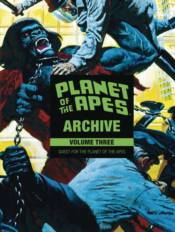 Experience Marvel Comics' legendary 1970s Planet of the Apes Magazine with new eyes. Remastered and collected here for the first time, this prestigious hardcover edition chronicles the birth of Caesar and his rise to power. From Paul Dehn (Murder on the Orient Express), Doug Moench (Batman), Rico Rival (House of Mystery), and more!